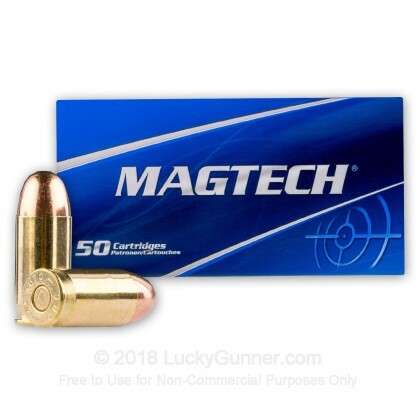 Magtech 45 ACP 230 grain, full-metal cased ammunition. Magtech is produced in Sao Paulo, Brazil. It's a state of the art factory-- in fact, it's one of the best in the world. And one unique thing about Magtech is that all the major components are made right there on-site. The non-corrosive powder and primers, the fully metal-jacketed bullet, everything is produced right there on-site, which means consistency. They meet all of the SAAMI specs for quality and control. Now this Magtech 45 ACP produces a muzzle velocity of 837 feet per second, with muzzle energy at 356 foot pounds. Now, to give you an idea of how serious Magtech is about quality control, they shoot two and a half million rounds of ammunition at the factory every year. Magtech is imported in over 55 countries, and is actually the ammunition used by 23 national law enforcement agencies. I tested Magtech 45 ACP in a number of pistols, including the Glock Model 36, the EAA Witness, Springfield Armory Champion, Colt Government model, and the old Ballester-Molina from Argentina. The function and quality is there. At 10 yards offhand, you've got accuracy. 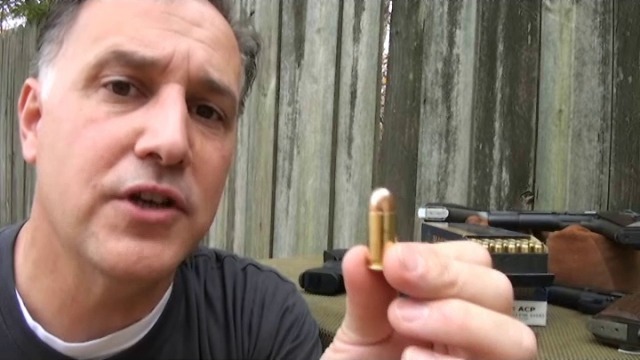 Of course, with the brass casing it's easy on the gun, but also perfect for reloading. Magtech Ammunition, I buy it for the price, but I shoot it for the performance. Probably a bit redundant, but the Magtech 9mm product (and the 45 ACP for that matter) is dependable, accurate, priced very competitively, and cleaner than most. In 1000 rd 'families' they arrive as promised, and go to the range only to last through one or two trips. I know, I know, redundant. I have said this before. Thanks Chris and Angela!! Great shooting ammo clean shooting in pistol.and no misfires.will buy again when I run out. Reasonable price, feeds/extracts reliably, reasonably clean, good ammo from the fastest delivery source. Pleasure to deal with. Consistent performance and great price. I've used Magtec Ammo in a variety of calibers. Always fires and range performance is excellent. Outstanding value for the range. Highly recommend it. I've shot hundreds of Mag Tech rounds in several calibers and have never had a ftf or jam. Excellent value. Excellent range ammo; great value, reasonably clean. I'm on my second 1,000-round order with absolutely no problems in my Springfield XD45. One fellow shooter now shoots Magtech exclusively at the range in his Glock with no issues. I have shot 50 rounds of the Magtech 45ACP in my Springfield Armory XDS and every round cycled properly. It performed as expected and I will definitely purchase more of it. Fired 300 rounds. No malfunctions. Accurate. Relatively clean-burning. Low price. What else can you ask for? Excellent rounds for target shooting at a great price. So far I have shot about 250 rounds with zero issues, no heavy residue, no misfeeds just a solid target round. I have shot these through a Glock 30sf and Kimber Ultra 1911 both guns functioned flawlessly. Great ammo for the money. The ammo worked flawlessly. No stovepipes or jams. I truly appreciate how Lucky Gunner continues to strive to supply it's customers with high quality ammo at great prices. I buy almost all my ammo from them! Magtech makes great quality ammunition. I have never had a mis-fire or other issues with it. It seems to burn cleaner that other ammunition. Highly recommended! CASE AMMO WAS DOUBLE BOXED AND IN GOOD CONDITION UPON ARRIVAL. I HAVE USED THE MAGTECH AMMO BEFORE AND HAD GOOD RESULTS, THE SAME RESULTS WITH THIS LOT. 200 ROUNDS SHOT AND NO FTF OR ISSUES IN RUGER 1911, MARLIN CAMP CARBINE, S&W GOVERNOR & KAHR CW45. NOT THE ABSOLUTE CLEANEST... BUT MUCH BETTER THAN MOST. A REALLY GOOD VALUE FOR PLINKING AND PRACTICE. Just went shooting again today and the ammo worked great! Excellent value! Magtech is my preferred ammo for my Para 45 and HK p30 in 9mm. Never had a problem with this brand. Thanks to Lucky Gunner for the best service and the best prices. Excellent ammo and sales experience! Purchased a new FNX-45 Tactical with a few boxes of the stores house brand ammo. The gun jammed every 5 rounds and I thought there was something wrong with the gun. 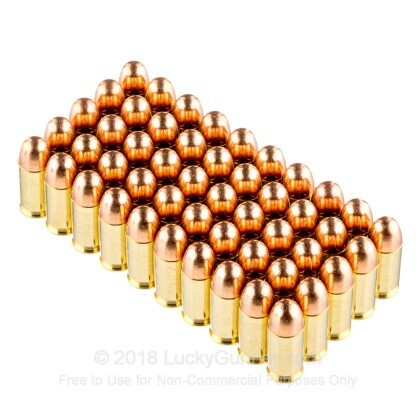 Purchased the 1000 Magtech 45 ACP 230 grain from lucky gunner and I am almost through the first 500 and not a single jam! My shipment arrived fast and was very well packaged. This ammo is flawless and priced very reasonably. Everything in the Magtech info-mercial is spot on! I'll update this review and let everyone know if I made it through the entire 1000 without a single jam. So far, so good, half way home. Got three misfires in the first box but six boxes later all fired. A bit pricier but worth it! Shot some and tucked the rest away. Excellent ammo / great price! Magtech makes reliable, clean burning ammo at a great price. Quick arrival, worked with no problems, on target, flawless for me. Put 500 rounds through S&W 645 with no issues. Would/will buy product again. This is good factory ammo which works accurately in all of my 1911's. I've never had a failure with Magtech ammo and it burns cleaner than Winchester white box. Magtech ammo a little dirty but out of a 1,000 rd. purchase I have shot 450 rds. with no problems. For practice ammo today it's a pretty good value. great ammo , fast service and great price. Couple of hundred rounds shot. Not one misfire. Solidly made performance. Shot a whole box through a Springfield .45 accurate and clean. The best Ammo for the price. I only use them in my best 1911s. I have used Mag-Tech Ammo for years. Very good quality. But, no I haven't had time to get to a range in a while. I am confident though from past experience the cartridges will perform fine. 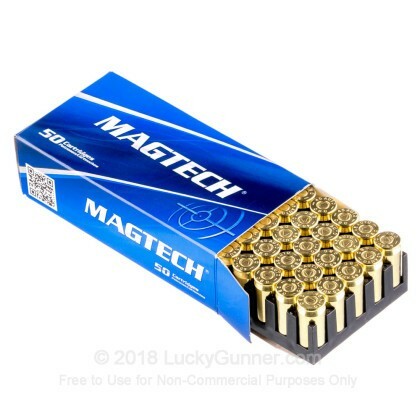 Have been using Magtech for a couple years now and have yet to have a FTE or FTF with this ammo. As a plus I reload and the brass is top notch. Great ammo for all levels of shooter. Have shot about half of my 1000 rounds with no problems, excellent service, this comes right to your house in just a couple of days. I will be getting more soon! A THOUSAND ROUNDS IN 5 DAYS, NO PROBLEMS, CLEAN, CONSISTANT.! LUCKY GUNNER GETS IT TO YOU PROMPTLY & AT A VERY FAIR PRICE! THANKS!! The service is excellent as always- order filled and here in 2 days The accuracy is fine, the shooter needs work. Bought for general practice and plinking. Fed through my 1911s (Baer, nighthawk, and older Gold Cup with no issues. Only one FTF well into shooting that was a lubrication issue and not to blame on the ammo. Ammo is just OK as far as dirty (there are cleaner and dirtier out there). For the price you can't beat. I have not gotten started reloading any of the Brass-but it seems like it will be OK too. No signs of bulges or head separation. LG shipped fast and was at my doorstep 4 days after order. Shipped next business day. Very impressed with ammo & service. 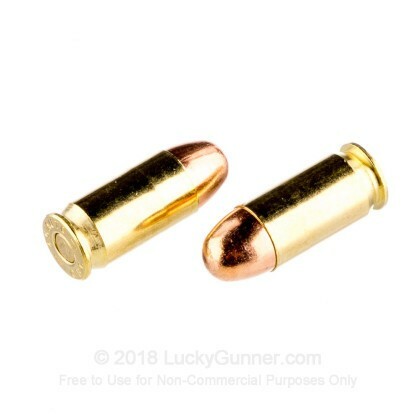 The little extra you pay is well worth the excellent service.ammo shoots accurate and VERY CLEAN. I've placed 2 orders with lucky gunner and both times ammo has been @ my door in 2 days, perfect packaging and unbelievable service. Will not hesitate to use these guy's again!!! Shot 500 rds. Thru sig p220,glock36& hk usp compact, not one ftf or fte what else can I say!!!! Will be ordering more Magtech in 380acp, 9mm, & 40S&W. Keep up the great work guy's, Some people do VALUE your great service!!!! All your products are top quality performers at a great price. This ammo is of good quality in both performance and price......Totally satisfied..Thank You. Shot 100 rounds through Bersa 45 UC and no FTE or FTF. Performed flawlessly and is clean and accurate. at 10 Yds, 3.5" barrel was right on the money. 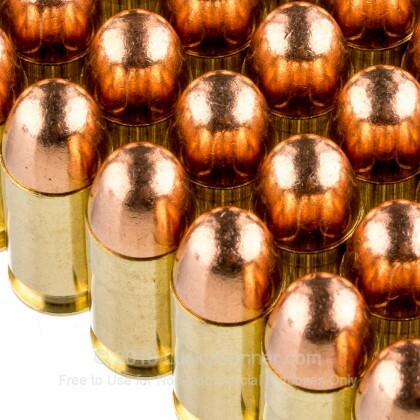 I ordered this ammo from to use in my new Sig P220. Have used it before in 9mm. Hi quality brass, zero feed problems, seems very accurate. What I like about the Magech is it seems very consistant. I am very happy I purchased when I did as the prices went up afterward. Ordering through LG was fast and easy. They updated shipping info and communicated instantly. Wonderful experience and I highly recommend LG to my friends and family. Thanks again. i have 500 rounds of Magtech through my Springfield 1911 TRP. Not one bad round. Lucky Gunner service is excellent. Ammo shipped promptly. Very accurate and clean! Very satisfied with this purchase. Strongly recommend to anyone who likes to target shoot with a 1911. I have a Desert Eagle 1911C, 4.25 inch barrel and it loves this ammo!! This ammo shot great in my XDM45. Burns clean. No complaints. Will buy again. After 1000 rounds, this Magtech performs better than any other ammo for my Sig Sauer P220. I have found Lucky Gunner to beat any other source...even with shipping to California included! Ordered 1,000 rds and fired 250 thru both my KImber Ultra CDP II and Wilson Combat CQB. No FTF or FTE's. Ammo is pretty clean and accurate; more accurate wiith CQB (4" bbl). I'll be ordering more of this soon. Delivery showed up in 4 days! IMO much better than Wolf and PMC. I have fired 300 of my 1000 rnds with no FTF or any other problems thru 2 of my 45's. Great customer service and prompt delivery. When compared to other inexpensive ammo I have purchased this far outshines the competition. Does not dirty the action does not misfire. All in all a superior ammunition for the cost. Very accurate and very clean. I'll keep using this brand in my 1991 Desert Eagle Commander. I've shot about 500 rounds so far through my Kriss and I've had no problems at all. Every round fired, and was as clean as you would expect a .45 round to be. Bought 1000 rounds and have shot 200. More accurate than I was expecting, no feeding issues or fail to fire issues. Good price. This is my first purchase of Magtech products, I'll will certainly consider this caliber and others in the future. Bought 1000 rounds and shot 200 rounds at the range the first day with my Les Baer 1911. No problems at all, tight grouping at 25 yards, indoor range and very clean. I am very satisfied with this ammo and it is very reliable and a great price. I will buy more soon and will recommend it to friends too. excellent service and great prices, Magtech .45 performs great in my Kimber, Sig 220, Colt Gold Cup, and Glock 21. Glock 30 and Kimber both love this stuff. My Glock 36 has some issues, but it is a Glock 36 after all. Feeding problems, stovepipes, just doesn't seem to like this stuff. BUT, the 30 and my Kimber love it. Not a single malfunction from either of these weapons. I'm completely satisfied with the product. I recomended it to a couple of friends of mine. When I need ammo, I will always go to the Lucky Gunner. Clean, reliable, and accurate in my 4” Springfield XD. No failures. Ordering another 1000. You get what you pay for. I couldn't be happier with my purchase. Good quality clean reliable ammo. High case quality for reloads. Excellent service; excellent product; great price. Fantastic ammo for range use, no misfires or jams. Will purchase more when this product is available. Everything was great about this product, but I wish it would be shipped in an unmarked box. This day and age you never know who would freak out over a 1000 rounds of ammo. Reliable ammo, shoots pretty clean. 500 rounds fired so far through my Beretta Px4 storm with no problems. Solid practice ammo. 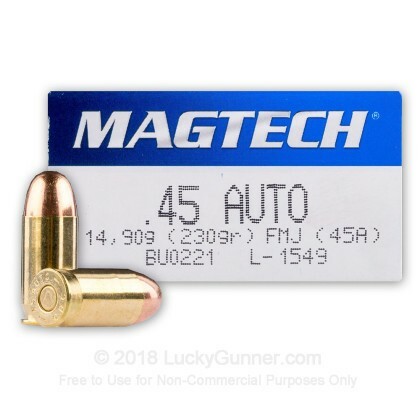 Nothing wrong with Magtech .45 ACP, but stay away from Magtech .308 win. I've been really impressed with the performance of the Magtech. Accuracy is impressive, performance on all levels is very good, no problems. My Springfield 1911 A1 seems very happy with it, so am I. It's even better when on sale! Go ahead and smoke a thousand rounds, you'll be happy you did. BTW, they have some great 44 ammo as well. I don't know why anyone would pay retail. I am impressed. I was not sure at first ordering over the internet but now I am a believer. Straight foward and to the point. Tested this ammo with four others, shot 1 1/2" groups at 25 yards. Great ammo for the cost. Tested this ammo against several other brands. Accuracy was superior. Shot 1 1/2 in groups consistently at 25 yards. Using a Kimber 5" barrel. Good Ammo! No problem with feeding or excessive smoke. I’ve put about 800 rounds through my XD(m)… all rounds fire. I’ve found the ammo to be a bit smoky, and sometimes have the first round fail to chamber. What I have discovered for the XD(m), you need to make sure the first round is set back firmly in the magazine. I use MagTech 9mm exclusively for my M&P Pro 9, and it works flawlessly, and not as much smoke. Not sure why the .45 offering is a different experience, you mileage may vary. Overall I recommend the ammo for cost effective range time. Using Magtech, has been a pleasure. All rounds load and fire with accuracy. Q: Is this large primer or small primer? A: Hello John, The Magtech ammunition is loaded with large pistol primers. We also have this 45 ACP - 230 Grain FMJ - Magtech - 50 Rounds ammo in stock in a smaller quantity.